We’re all broken people, born to broken parents in broken families. Often, we feel ashamed by our brokenness and try to cover up the ways we fall short. But God wants us to find beauty and hope in the messiness of our lives. Today’s guest knows first-hand how it feels to find God’s grace in the midst of her family’s brokenness. Elisa Morgan was named by Christianity Today as one of the top fifty women influencing today’s church and culture and is one of today’s most sought-after authors, speakers, and leaders. She has authored more than twenty-five books on mothering, spiritual formation, and evangelism, including The Beauty of Broken, Hello, Beauty Full, She Did What She Could: Five Words of Jesus That Will Change Your Life, the NIV Mom’s Devotional Bible, and her newest release The Prayer Coin. For twenty years, she served as CEO of MOPS International, one of the premier ministries for serving mothers across the world. Under her leadership MOPS grew from 350 to over 4,000 groups throughout the United States and in thirty other countries, influencing over 100,000 moms every year. Elisa now serves as President Emerita. 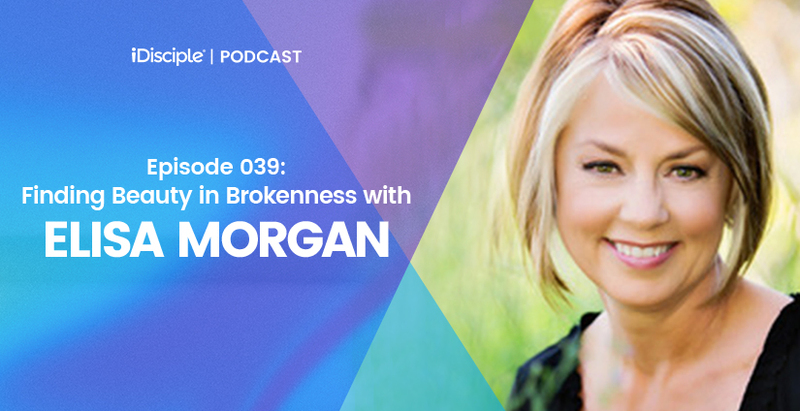 Elisa is joining us on the iDisciple Podcast today to walk us through The Beauty of Broken, her personal story of her family’s brokenness and how she found beauty in God in the worst situations. Her story is an inspiring look at how to trust the Lord in difficult times, and a beautiful reminder that we’re all broken but God is bigger than our flaws. We hope and pray that this conversation brings you comfort in difficult times and shows you how to thrive no matter your circumstances. The reality that the brokenness in the family we are born into is not our fault, and we can only be responsible for our responses to that brokenness. How all of the different broken families in the Old and New Testaments, including Jesus’ own family, show how normal it is to have flawed people around us. Elisa takes David and our listeners through some of the hardest moments of brokenness in her family life, including alcoholism, abuse, miscarriages, and other difficult times. Why we often feel responsible for the wounded and hurting people around us, and how we should approach them with love as believers instead of condemning them for their flaws. The way that Elisa dealt with her private family struggles during her time in charge of MOPS, and how she would’ve done certain things differently. What she means by “hope grows in the soil of forgiveness” and how we should go about forgiving the people who have wronged us. If you would like even more life-changing content, download the iDisciple app for your preferred mobile device today! Since 2013, iDisciple has been leading people into a closer relationship with God through music, sermons, and devotionals, all in the palm of your hand! Check out iDisciple.org to learn more.